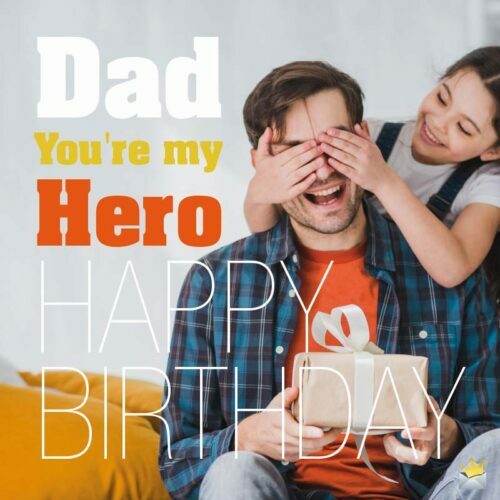 Need a very inspirational birthday wish to send to your father? We’ve got a wealth of that right here for you. So go on and make your father’s birthday a positive and memorable one with the following beautiful and truly uplifting lines. I believe that you can overcome all obstacles because the Lord is your refuge and strength and nothing in this world is greater than that. Wishing you a very marvelous birthday, dear Father! Many happy returns, beloved father! The secret to a very successful family is a brave and lovely dad like you. I am proud of you and I pray that God will continue to lift you up and increase your greatness. With very strong values, beliefs, determination and a great character, you should be able to withstand the most powerful storm. Celebrate this great day with the knowledge that nothing can take away the happiness you deserve in life if you do not give the green light to it. Wish you the best, daddy! You have always taught me that dreams are like blueprints, and with effort and determination, one can convert them into reality. Even though it might seem difficult, unbearable, and impossible you should trust that with the Lord all things are possible. He always makes a way where there seems to be no way. Dad, wishing you good luck and great health as you celebrate this magnificent day of your life! Thank you so much for being that inspirational ray of hope in my world. 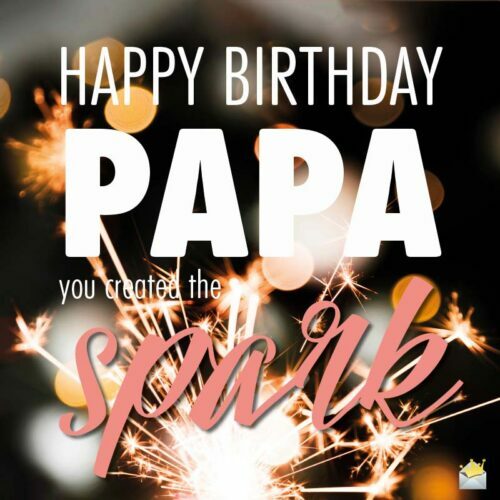 Daddy, for this awesome moment in your life, I pray that the holy hand of God keeps on lifting you higher and higher in your strive to achieve true greatness. Hearty birthday! I want to seize this special moment to let you know how amazing a father you are and also to remind you of the admirable strength inside of you that can overcome all obstacles. Dad, you’re my hero. Happy Birthday. Dear Dad, you are a shining example to this ménage, and I am so much inspired by your astounding accomplishments which have made me a truly proud child. Wishing you a marvelous anniversary! Happy anniversary, father! You are truly one in a billion and I can’t help but wonder how many children can boast of a magnificent parent like you. I wish you real joy, happiness, success, and great health as you celebrate. When you have nothing inside that is holding you back, then there is nothing outside that can hold you back. Wishing you a joyful and a memorable celebration, Dad! Your passion and desire to succeed have always been quite formidable, and I must confess how exulted I am to call you my father. Dear Dad, no matter how complicated the situation is, I am quite certain that you will come out victorious in the end. Wishing you a terrific celebration! It is usually the last page that matters the most and not the first page. I am quite sure that things will turn out great and truly successful for you and this household. Happy anniversary, Father! It is indeed an immense joy and a divine blessing to have a true hero like you for a father. Your life and achievements are inspirational. Wishing you a fantastic anniversary, beloved Father! Happy birthday to a truly wonderful dad! You deserve so much love, respect, and applause for your hard work and pure dedication to make this family a prosperous one. Best wishes, Father! I must admit how awe-inspiring your accomplishments are to me and this household. I know with all certainty that you are destined for distinction. Thanks for making me so proud. Dearest Father, as you mark this extraordinary day, I hope that it inspires you to achieve all the goals and dreams that your heart yearns for. Happy Birthday, papa. You created the spark. Happy birthday to the man who has had a huge impact on my past and continues to impact my future! Dad, may God bless in a truly awesome way. Dad, you are indeed my greatest hero and someone who deserves to be praised. May God bless you with everlasting happiness and good health as you celebrate! Dear Dad, honestly, you are the secret behind the great steps and the many astounding victories that I have had in this life. You are such a marvelous father, and I wish you a splendid day of birth! May the God, who solves impossible situations, be your guide and protector as you celebrate your birthday today. Wishing you a peaceful and a joyful celebration, Dad! Hearty birthday, dear Daddy! From the core of my heart, I want to let you know how grateful I am for all the valuable lessons that you have imparted in me and also for the kindness and love you have always showered me with. You are my greatest strength, my superhero, and my mentor. You have taught me to never stop believing in myself, and this has made me who I am today. I wish you a marvelously Big Day, dear Dad! Your kindness, generosity, thoughtfulness, and honesty are the key values that I admire the most about you and I believe they are the reason behind your legendary status. I wish you a wonderful birthday, dear Father! Life provides a lot of opportunities and possibilities to be happy. I hope you never stop seeing and receiving these great treasures of life. Happy Birthday to the best ever Dadda! Life can be full of many unexpected events, but whatever happens, I hope you can find strong faith and confidence in the Lord to guide you through life’s journey successfully. Wishing you a hearty birthday, dear Dad! Happy blessed birthday, Father! May this new age bring you enormous joy, laughter, favor, opportunities, happiness, peace and good health throughout every moment of your life. Dearest Father, you are respected because you are a great leader and you are truly appreciated because of the unconditional love and care you give us. Best Wishes for your Father | Happy Birthday, Dad! Share a birthday wish and spread the words of Happy Birthday Messages.